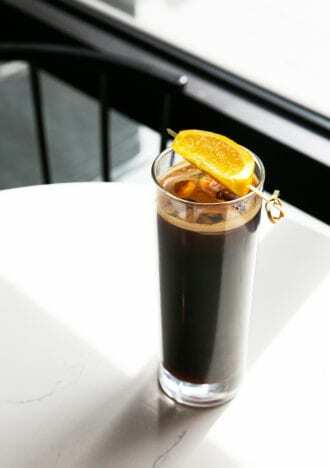 At the café at Nashville’s Bobby Hotel, cold-brew gets an extra dose of sunshine thanks to the addition of orange sweet cream. The drink is served on nitro at the bar, but it will taste great with whatever cold-brew you have on hand. Fill a Collins glass with ice, then add the cold-brew. Layer the orange sweet cream over the top, then garnish. Mix all the ingredients together and store in the refrigerator.